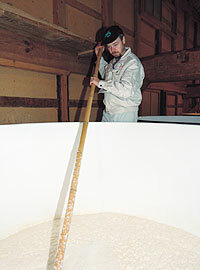 Harper stirring the moromi mash (a fermenting mixture of rice, water, koji and yeast). 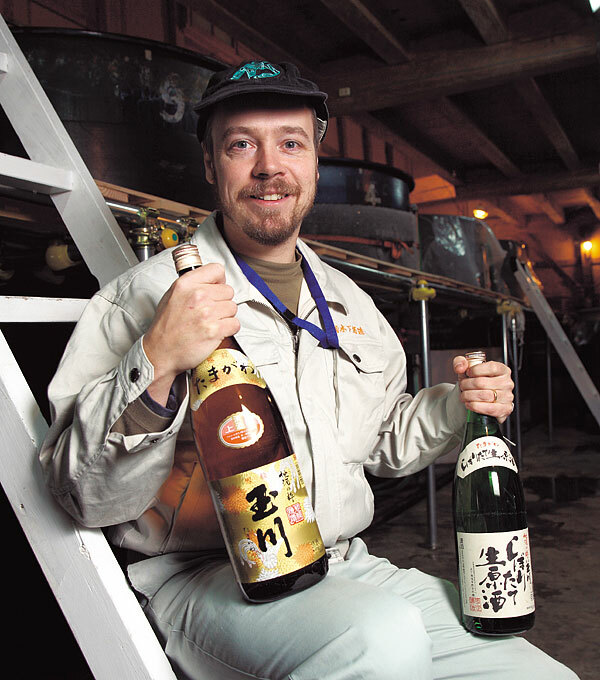 Philip Harper is Japan’s first toji master brewer from abroad. His Japanese is fluent, and his body language is like that of a native. He was born in Birmingham, England, 41 years ago and studied English literature at prestigious Oxford University. “After graduation I wanted to live in another country, so I applied for the Japan Exchange and Teaching (JET) Programme run by the Japanese government. They took me, and I ended up teaching English at a junior and senior high school in Osaka. After finishing his two-year stint with the JET Programme, Harper stayed in Japan and started working part-time at that tavern, keen to explore his new fascination. He taught at an English conversation school during the day, and kept learning more about sake at the tavern in the evening. Less than a year later, a friend asked him to work at a sake brewery in Nara Prefecture. He jumped at the chance, “made bold,” he grins, “by a few sips of sake.” He was 25 at the time. Working in a sake brewery is known to be tough. The kurabito laborers work under a demanding master brewer, and each one has a specific job to do. His job during the first year was milling. During busy periods he would machine-polish four tons of brown rice a day, and bag it by hand. His second year: steaming the rice in big pots. And in the third year he cultivated koji mold, using some of the steamed rice as a base. All this gave him valuable experience in each process. Harper stayed at the brewery for 10 years, and finally qualified as a master brewer. Soon after, he was asked to work at breweries in prefectures including Ibaraki, Osaka and Kyoto, and managed their operations. “Each brewery had a different type of water, and the yeast and other microorganisms were a bit different as well, so there was no set way of doing things.” Each job was a learning experience, raising his expertise day by day to ever higher levels. He also found time to write two English-language guides to Japanese sake, and organize sake-tasting events overseas, promoting the world of sake. The Kinoshita Shuzo Brewery in Kyotango, Kyoto Prefecture, where Philip Harper works as a toji master brewer. to sake, written by Harper. They include descriptions of places serving and selling outstanding sake brands in other countries.